In 1978, after power washing buildings for a few years, we created Awning Care Plus because our clients didn’t want to mix a clean building with dirty awnings. We trained our technicians on the various awning cleaning methods, as well as the best products for each variety of awning materials. 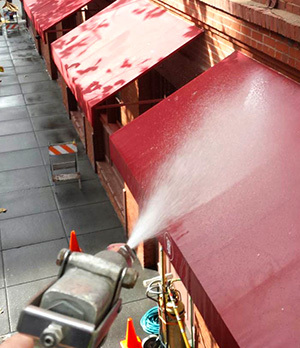 Awning Care Plus, a division of Van Gelder Enterprises, has been cleaning client’s awnings on a regular basis, such as San Francisco Honda’s awnings at the corner of Van Ness and Market, for over 12 years plus many other clients in the SF Bay Area who maintain high standards of appearance for their properties. All vinyl and canvas awning fabrics are carefully and thoroughly cleaned using our high-pressured warm water cleaning solution method, followed by a complete flush and rinse process. We have a fleet of 12 radio dispatched trucks and 6 mobile aerial boom truck units. We provide excellent results in difficult logistical situations with a minimum of inconvenience to our client’s staff or clients. Each job is completed by our team of full-time, long-term technicians. We have made the choice to do all of our own work to ensure that each phase of every job we do meets our exacting quality standards.